Set in the heart of a 12-hectare pine forest beside the Atlantic ocean and with direct access to Lacanau's fine sand beach, the Yelloh! Village Les Grands Pins provides an idyllic setting for invigorating camping holidays in Aquitaine. The "La Baïne" heated aquatic area with lagoon, slides and a 4-lane water slide, water games for children (water tree) and covered pools or the Zen swimming pool with lap pool and Jacuzzi: discover water in all its forms at the camping Les Grands Pins. You'll also be able to enjoy the activities and entertainment throughout your stay, with sports & watersports, Kids' Clubs, shows and entertainment evenings, so your days will be action-packed during your camping holiday in Aquitaine! Campsite reception is open every day from 9 am to 8 pm. - Leisure: new multisports ground, new outdoor fitness area and much more! - Entertainment: new giant screen, creation of an escape game in the midst of nature! Site very clean and staff very welcoming. excellent location. Come and enjoy a camping holiday staying at the Yelloh! Village Les Grands Pins in Lacanau and explore the fascinating surrounding region! 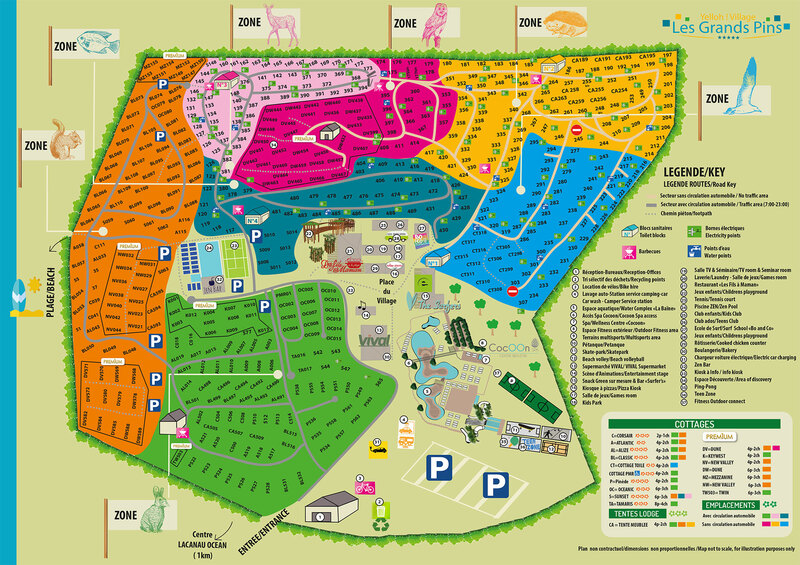 Our campsite is perfectly located, just 350 metres from the beach at Lacanau. With your family or your friends, you'll be able to enjoy all sorts of activities, as well as top up those batteries whilst exploring its lovely scenery. Make the most of those long summer days and explore Lacanau Océan and its unique environment, with the ocean and forests. Your holidays at the Yelloh! Village Les Grands Pins will be thoroughly exotic!